After creating a bunch of blogs on blogger.com , creating a new entry on the wordpress.com blog site. The reason for this, is an itch that I’ve suddenly felt. 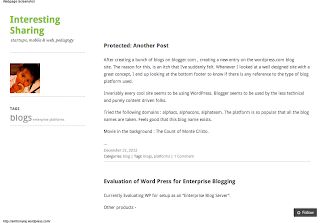 Whenever I looked at a well designed site with a great concept, I end up looking at the bottom footer to know if there is any reference to the type of blog platform used. Invariably every cool site seems to be using WordPress. Blogger seems to be used by the less technical and purely content driven folks. Tried the following domains : alphacs, alphacons, alphateam. The platform is so popular that all the blog names are taken. Feels good that this blog name exists. Movie in the background : The Count of Monte Cristo.